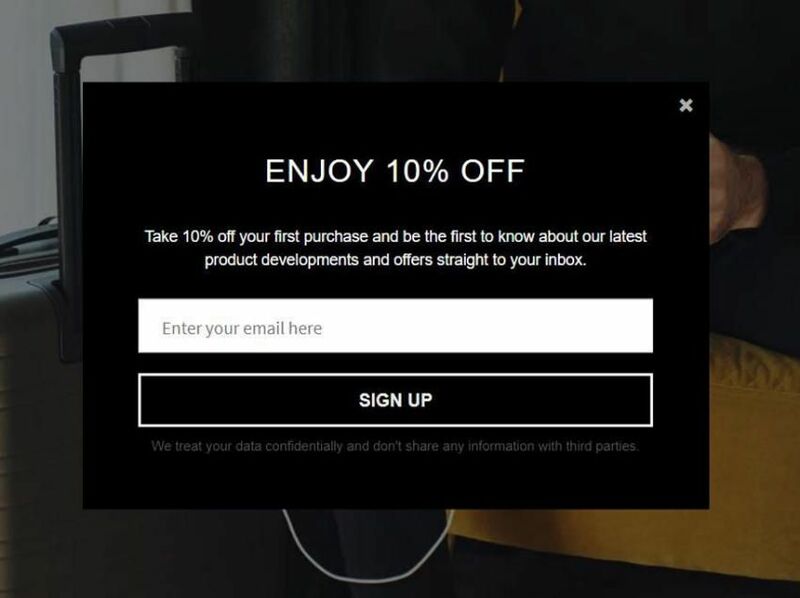 Learn the best practices for using exit-intent popups to engage visitors who are leaving your site and increase conversion rates. Imagine that your website could detect when a visitor was just about to leave. What could your business do with that information? Would you beg them to stay? Would you sweeten the deal? Would you ask them why they are leaving? Right now, exit-intent technologies can detect when your visitors are about to hit the back button, close their browser, or navigate away. Then popup dialog is presented to them, a last-ditch message to get their business. Are you using exit-intent popups? If not, you are leaving money on the table—quite a lot of money, actually. Exit-intent popups are known for several years now but it’s still a hot topic of conversion optimization. In case you haven’t heard of them before, let’s summarize quickly what are they. They are the popups that appear the very moment you move your mouse to leave a page. They are “overlay popups,” and cannot be blocked by popup blockers. 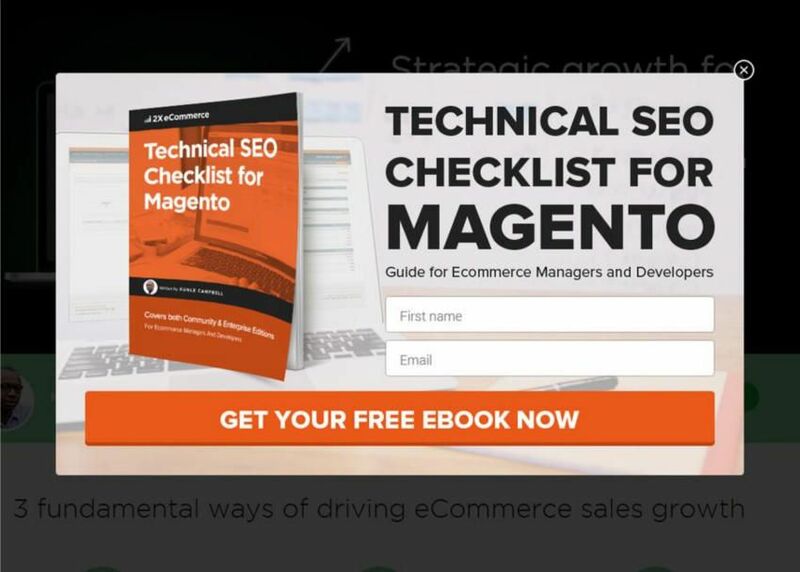 This exit-intent popup teases a free eBook. Why Should You Use Exit-Intent Popups? Exit-intent popups give you a “second chance” at communicating something important to your visitors before they leave your site. According to data, 10 to 15 percent of lost visitors can be “saved” by using exit-intent popups. In other words, between 10 to 15 percent of visitors leaving your site will respond to a well-crafted message. Exit-intent popups are the most customer-friendly approach to communicate a special message to your visitors. They are superior to normal popups because they don’t interrupt your visitors while browsing or scanning your site; they only appear when your visitors start to leave your site altogether or switch to another window. 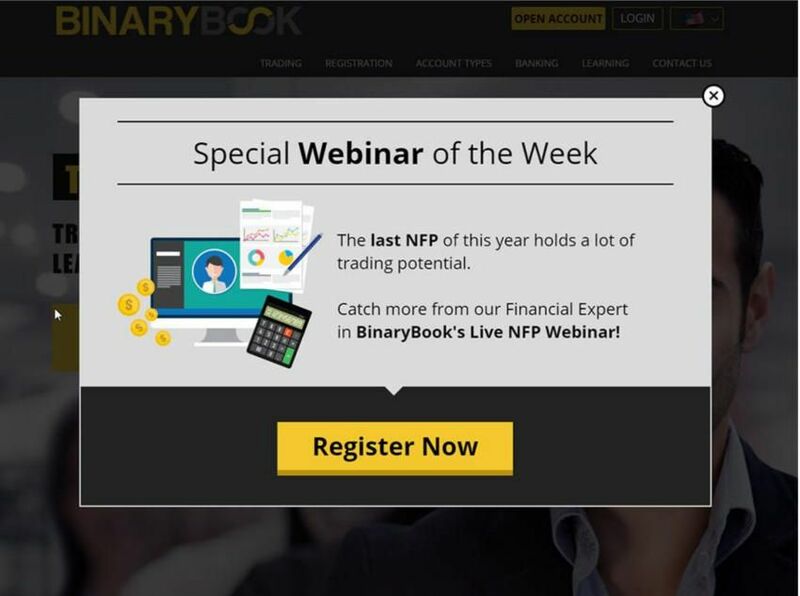 So how can you maximize the ROI of your exit-intent popups? One of their most effective uses is to grab email addresses by offering an incentive to subscribe. Naturally, the conversion success of email collecting popups depends upon the effectiveness of the copy and the offer. Exit-intent popups can be used to grow your email list. According to data from OptiMonk, a simple popup like this converts between three and five percent on an average content or ecommerce site. To achieve this level of performance requires no preparation, and you can install the popup on any page. Informational offers can turn 15 percent of abandoners into leads. You can also boost your results by gamifying your message. A lucky wheel popup can not only increase your conversion rate and coupon usage rate, but it also enhances your user experience: everyone loves to win, and it will give shoppers a reason to remember your store. 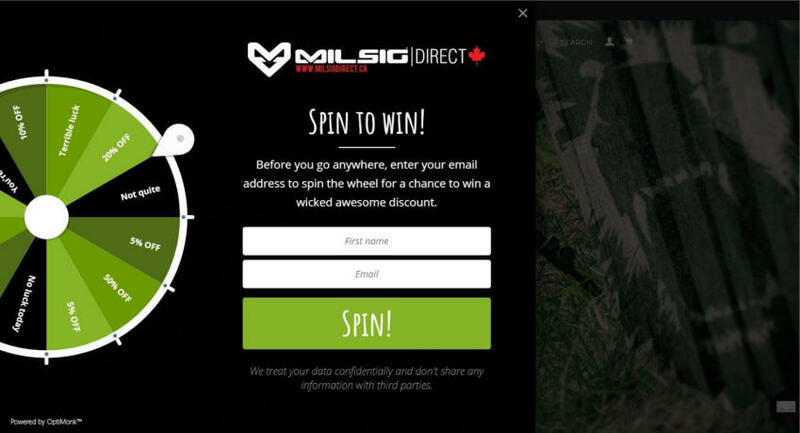 A lucky wheel can create a new, fun and interactive subscription experience on your site. E-commerce sites should use exit-intent popups for instant cart-recovery. Since cart abandonment is about 70 percent, exit-intent popups can potentially save a lot of lost revenue. The best method of conversion during checkout is to offer visitors an incentive to finish the order on the spot, such as a price discount or free shipping. Exit-intent popups can sweeten an offer and save a sale. 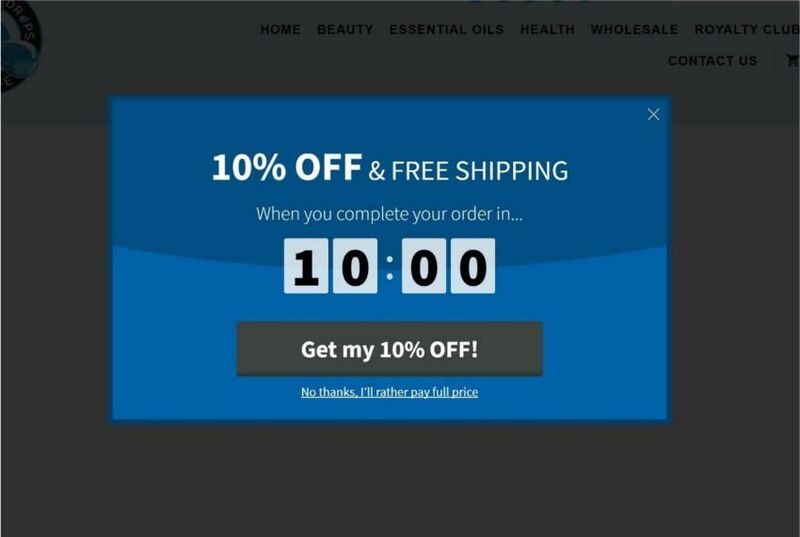 This type of popup usually converts around 15 percent, especially if you turn off the email capture, though you should follow up with these users later by email, since only about 5 to 15 percent will use their coupons immediately. You can even use it on landing pages, to give yourself a second chance to hook visitors who are not converting on your landing page. Redirect visitors who are about to leave to something that may be more relevant. E-commerce sites can use this method by showing alternative offers to visitors not interested in buying the current products. Content sites can use it to promote other content the reader may prefer. 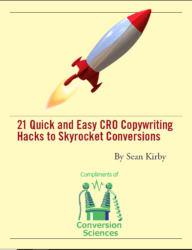 Content redirection popups can convert up to 25 percent. The most important rule of every exit-intent popup is to keep it simple. Don’t try to stuff too much content into one popup. Less is more. People leaving your site are often already overwhelmed by its contents; they may be unable (or unwilling) to understand complex messages. So, make sure your headline tells your visitors immediately what benefit they will receive. The look of your popup is also important. Try to use a simple and clear design that matches to your website. Since you only have a few seconds to get visitors attention, you should always use readable fonts. One large tagline, one sub-headline, and some visual reinforcement of the offer should be enough, 99 percent of the time. Don’t forget that the look of your popup is just one thing, but if your offer is not good enough, you won’t succeed. Always add a relevant offer and try to focus on pain points. Adding a sense of urgency always makes popup more effective since it helps to overcome procrastination. 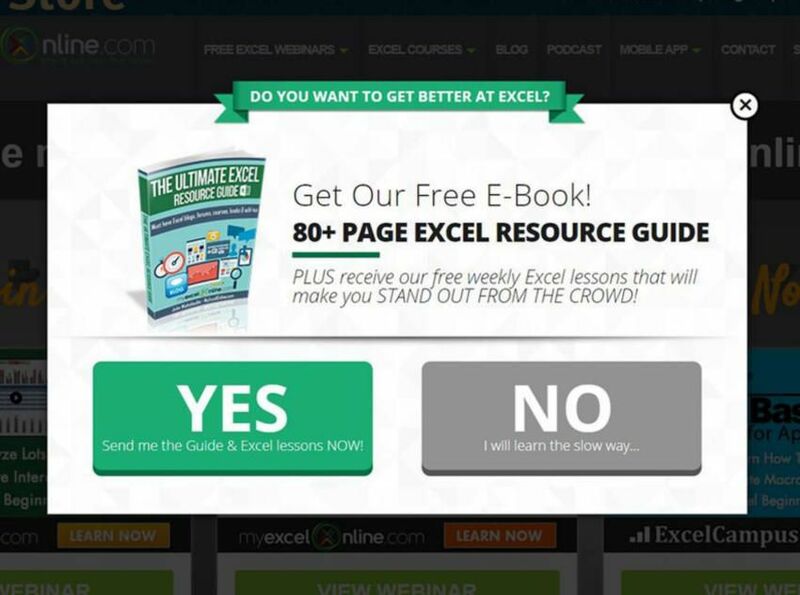 Here’s an article if you want to learn more about creating a good exit-intent popup. When we say that an exit-intent popup appears at the very moment the visitor moves the mouse out of the window, this means that the popup appears a few milliseconds later—and the amount of time, no matter how miniscule, does matter. You have less than 200 milliseconds to show the visitors your message before they actually click on the X button. In fact, you should decrease this lag to less than 50 milliseconds. How can your popup respond so quickly? First, it is important to preload the popup content. Loading in real-time takes longer than 200 milliseconds. Preloading takes technical know-how, but the best exit-intent popup software has already solved this issue. You should refrain from using special effects on these types of popups. Such displays look cool, but they increase the amount of time required to display the popup, as well as the time needed for visitors to comprehend the message. The same rules apply to exit-intent popups as to any other webpage or landing page—always test the copy. For example, in this test, changing only the tagline of the offer resulted in a 47 percent increase in conversions. Test your copy to get even more lift from exit-intent popups. My last piece of advice is to start NOW. You are losing customers every minute. The easiest way is to register at www.optimonk.com/register, and learn about our exit-intent popup solution. We can help you create effective exit-intent popup campaigns as easy as ABC. $4 Million for 35 Subscribers: Does Newsday's Online Newspaper Have a Sales Conversion Problem? Thanks for the tips! I have only started using exit intent widgets a couple of month ago. My live chat provider, Visitlead, started offering them so I gave it a try and I have to say that it is just great. I haven’t exactly measure the improvement in my conversions yet but I am very happy so far. And Sarah, why are you everywhere? Exit Monitor http://exitmonitor.com is the best exit intent software. I don’t understand. I probably see these popups 10-15 times a day for the last 3 years. I’ve *NEVER* signed up for a newsletter using them. Wait, if they popup withing 2 seconds of me seeing the website for the first time, they get filled with an email address thats going to bounce. I’m still trying to find Firefox plugins that will block the browser from telling the website where my cursor is on the screen. And Cart Abandonment? If it becomes known that all you have to do is abandon a cart to get a discount, its going to get done even more often. I’ve purposely left just seeing if I can get a further discount by walking away. Everyone complains more about popups. In test after test, they work. And, there are few retailers who will complain about losing 10% for those transactional buyers who love a discount. You, Matt, are a small percentage of the marketplace. Excellent point. Never ceases to amaze me how people will opt for anecdotal “evidence” over the actual, verifiable stats on what works. This holds them back time after time in my professional field. We recently started using popups on our Mens fashion and have experienced better than moderate success. In fairness, we’ve only really had these tools for a few years, so people are still catching up. Surf the web, though, and you’ll see that popups are everywhere. Exit Intent popups are mostly used by eCommerce websites to retain their visitors on the website and help them to explore more on the website. By providing a huge discount through a popup can help visitor to take action and increase the revenue. Such popup help to reengage the visitors and also help to decrease the bounce rate of the website. Actually, we’ve seen exit-intent popovers work against us on ecommerce sites. We recommend testing them. Well, Brain I recommend to show time tracking popup on top performing pages, such popup will eventually give your satisfactory results. And for exit intent can you share, which exit intent design you have been using for your ecommerce website. Testing with multiple design can help you choose faster. Like Brian I’ve seen popups that either kill it, don’t do much or make conversion rates worse. Slamming an exit intent solution on a site and then hoping for the best isn’t the right exit intent strategy. The best (credible) results come from brands that a) test multiple designs, execution points and purposes b) go smarter (i.e. not showing a newsletter signup popup to someone who has already signed up, not showing a discount to someone who has already entered it or used it) and c) do their maths before hand so they don’t end up with increased conversion rates, but a lower margin. Can’t argue with any of this. Follow the ABCs, folks.